Study rooms are intended for student collaborative study and group projects. Faculty and staff needing space for classes, meetings, or events should contact Campus Coordination at (562) 944-0351, ext. 5816. Groups of two or more people may reserve a study room online with an active NetID and password. Individuals may not reserve a study room for personal use. 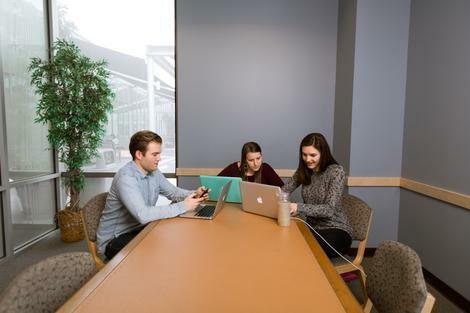 Individual study is permitted in group study rooms; however, a group with a valid reservation may ask any occupant without a reservation to vacate a room immediately. Study rooms are available on the upper and lower levels of the library. Each room is equipped with network connections, an electrical outlet and whiteboard. Whiteboard markers may be checked out from the Information Desk. A media study room is equipped with a large screen monitor, compatible for use with either a PC or Mac laptop. Reservations can be deleted if the room is no longer needed. The original reservation email will contain a URL that allows the group to cancel their reservation. If the original reservation email cannot be found, please visit the Information Desk. Reservations may be made up to two weeks in advance by users with an active NetID and password. No more than two hours may be booked by a single user in a single day. Large group study rooms may only be reserved for groups of 4 - 6 people. The Library reserves the right to cancel reservations made by non-Biola users or anyone not permitted to use the rooms. The person who reserved the room with his/her NetID must remain in the room with their group during the time of use. NO SHOW POLICY: Group reservations may be cancelled by library staff if rooms are not occupied within 15 minutes of the reserved time. The Library is not responsible for the security of personal items. Any items left in rooms after the end of the reservation period may be removed by library staff and placed in the library’s Lost and Found or taken to Campus Safety. Group study rooms are not soundproof. Please keep noise at a reasonable level. Food is allowed in group study rooms per the Library’s Food and Drink policy. Please dispose of trash in an appropriate manner. Come by the Information Desk or contact us at (562) 903-4838.